As you may have noticed, I’m a huge fan of Knit Picks’ yarns! Billow is no exception! This yarn is so buttery-soft, and is perfect for projects that will hug your body, like hats, wraps, cowls, and afghans. Seriously, it is so smooth and wonderful. If you’re sensitive to wool or acrylic yarns, then I believe this would be an excellent yarn to add to your collection. I recently made a hat with it, and it worked up like a dream! 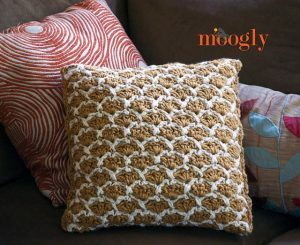 This amazing, bulky weight (5) yarn is 100% Pima cotton and comes in 16 beautiful, muted shades. The yarn is 8-ply with a subtle thick and thin texture that gives your projects a unique, rustic texture. 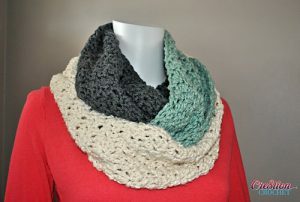 Each hank is 120 yards; grab one hank to whip up a cozy beanie, or use 2 for a soft scarf or cowl! I highly recommend this yarn for projects with simple stitches. The drape and texture of this yarn will take a simple single crochet beanie or classic granny square, and elevate it to the next level. If you’re like me, and you prefer to use larger hooks, this yarn works great with US size K through M hooks. And did I mention how SOFT it is? Seriously, it’s very soft! Snag a hank or two for yourself — you will love it! If you want to give this beautiful yarn a try, you can Buy it Here! 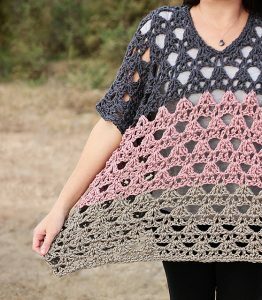 I’ve rounded up 3 lovely patterns made with Knit Picks Billow, too! Click the pics & Enjoy!